1. Preheat your oven to 350º. Line a muffin tray with 12 cupcake liners. 2. In a bowl, combine the oats, flour, sugar, baking powder, baking soda, salt, cinnamon, and nutmeg. Stir with a fork or whisk to thoroughly blend the ingredients. 3. In a separate bowl, whisk the egg. Add the milk, vegetable oil, and yoghurt and whisk to combine. 4. Wash your zucchini and trim off the ends. Grate the zucchini and stir it into the wet ingredients. 5. Add the wet ingredients to the dry mixture and stir to combine. Wash your berries and gently fold them into the batter. 6. Spoon the batter into your muffin liners until they are about 3/4 full (if you have leftover batter, you can fill the cups a bit more). 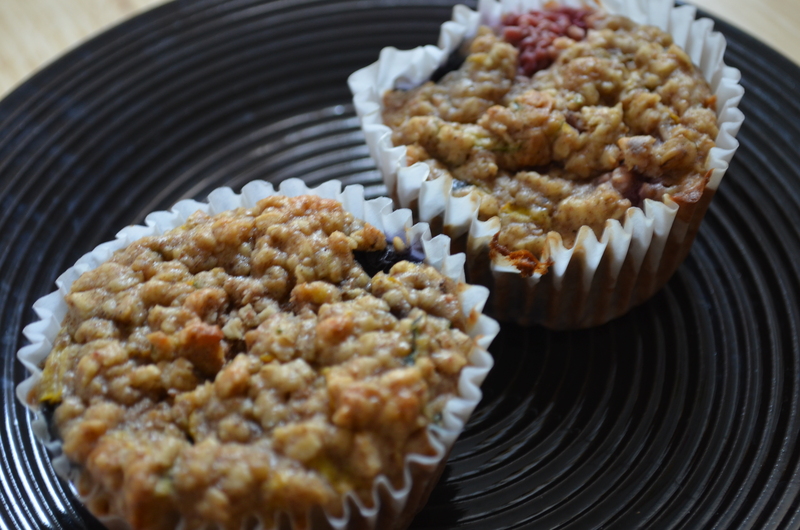 Bake the muffins for 25-30 minutes, until a toothpick or knife inserted into the muffin comes out clean. 7. Once you remove the muffin pan from the oven, transfer the muffins to a wire rack immediately to allow them to cool. Serve these muffins fresh out of the oven, or cooled the next morning. I recommend refrigerating the muffins if you have any left after 2 days to extend their shelf life. This entry was posted in Breakfast and Brunch, Desserts and Baked Goods, Snacks, Vegetables, Vegetarian and tagged baked goods, baking, blueberries, breakfast, brunch, healthy, muffins, oatmeal, oats, raspberries, snack, vegetables, vegetarian, zucchini by laratboulos. Bookmark the permalink.